Properties in Port Charles average 4.5 out of 5 stars. Property 20: Stunning ocean views, hidden gem close to beach. Very private and quiet. 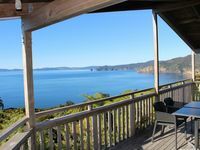 Property 26: Waitete Bay Beach Retreat - NICE! Property 34: Arani - chalet with island views. 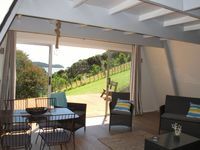 Very tidy bach in a great location, I don't think you will find better accommodation in this part of the Coromandel. Well equipped kitchen and extra fridge/freezer in the laundry means you can easily store a weeks worth of food and keep the drinks cold. Great BBQ on the deck. Great fishing options close by, we will definitely be back!